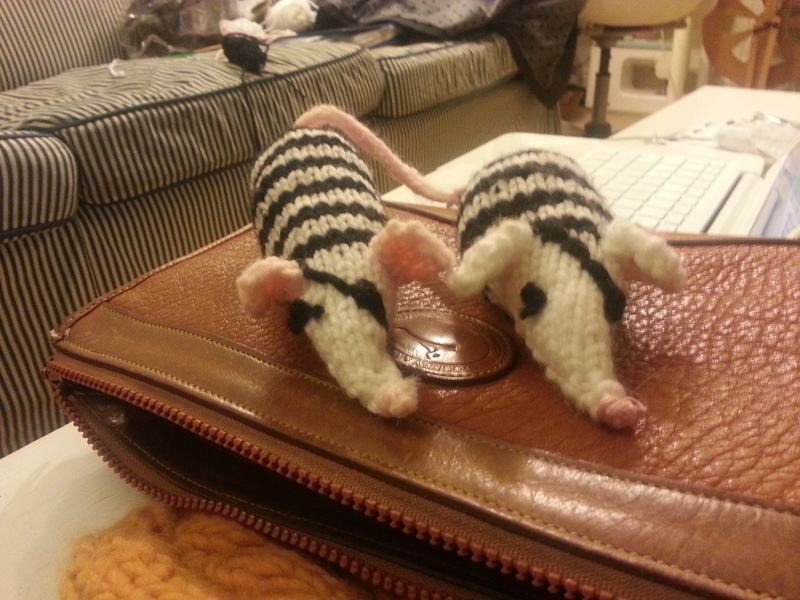 After my last post, you may have the impression that I am a big-intense-project kind of knitter. It’s actually the opposite! In the great debate of process knitter vs. product knitter, I often fall into the latter category. I like to have a regular supply of finished objects. And when I am slogging through a long-term-commitment pattern (like a sweater), I have to have a small project (or two) on the side just so I can finish something. I’ve collected eight knitting projects that I have completed in the last three months, all of which take a minimum amount of yarn and less-than-average amount of time to complete. Some of them follow a specific pattern, some of them are my modifications of other patterns, and a few of them are my own original work. I wasn’t the best at getting quality photos of everything, but you can at least get the gist of how they look. Enjoy. In a category that could alternately be called “small square things knit with cotton,” I made the following Christmas gifts. 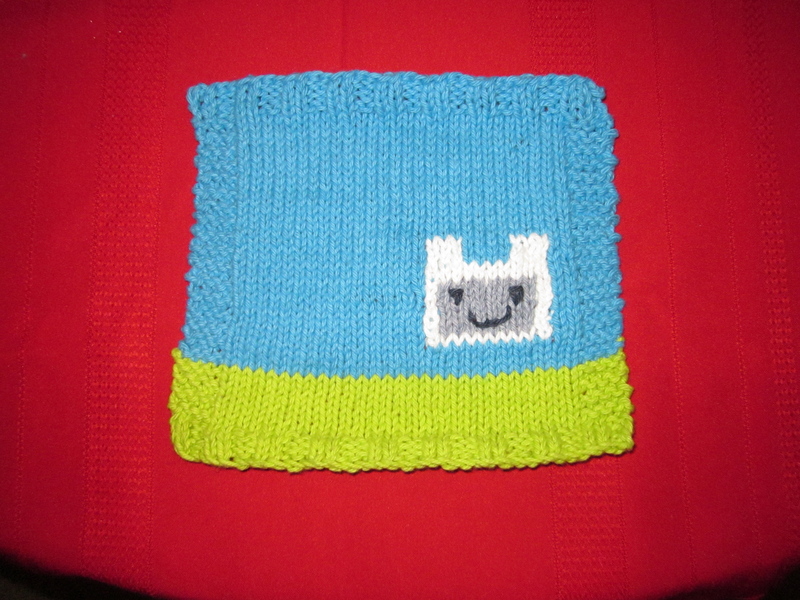 For my brother, I made an Adventure Time washcloth of Finn (I was going to do Jake too, but I used up all my yellow yarn on the potholder…) I used this fingerless mitts pattern as a starting point, but obviously I changed many things. I used size 3 needles and both ribbing and garter stitch for the edging. I knit from both ends of the white yarn so that there would be no stranding on the reverse side. I honestly didn’t write down the number of stitches I cast on, it was probably 32 or 36. I had to improvise with Finn’s face, not having a skin color, but I think it still worked ok! 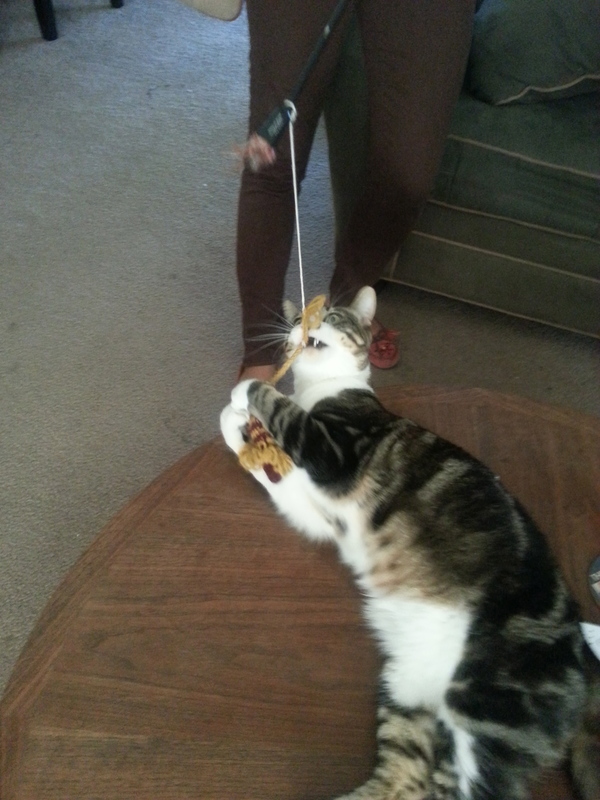 I knit the entire thing while my mom and grandma were wrapping presents, so it went pretty quick. Clean your toaster with a toaster! 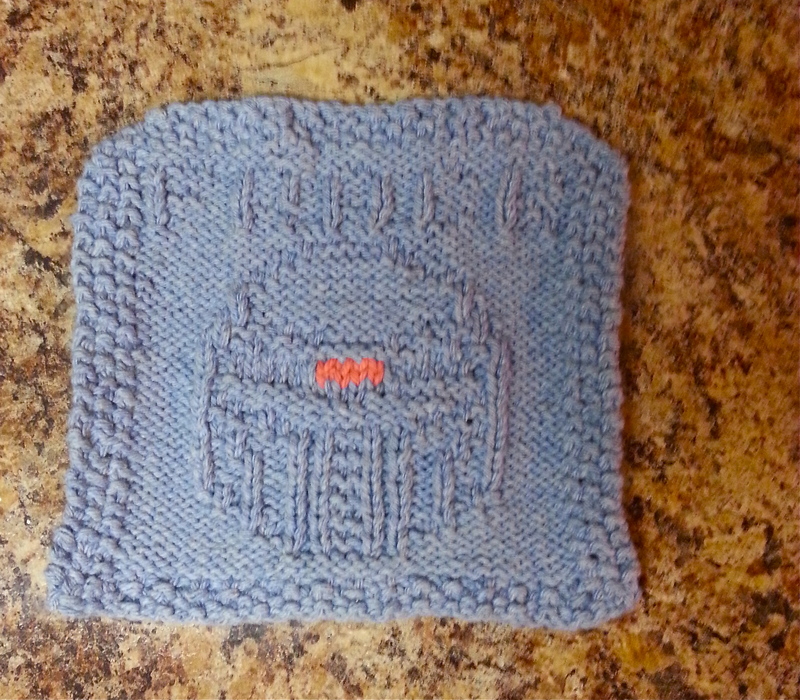 For my friend Sarah, who introduced me to Battlestar Galactica, I made this Cylon dishcloth. I love it, even though it came out a little squished because I went too small on the needles (size 2—I knit so loose usually). I followed this cylon potholder pattern but when it became clear that my gauge was too small, I added a new detail to the top. It’s hard to see, but if you look you can just make out the word FRACK. And then of course, I couldn’t resist cutting off the top corners (wish I’d thought of this at the bottom corners!) 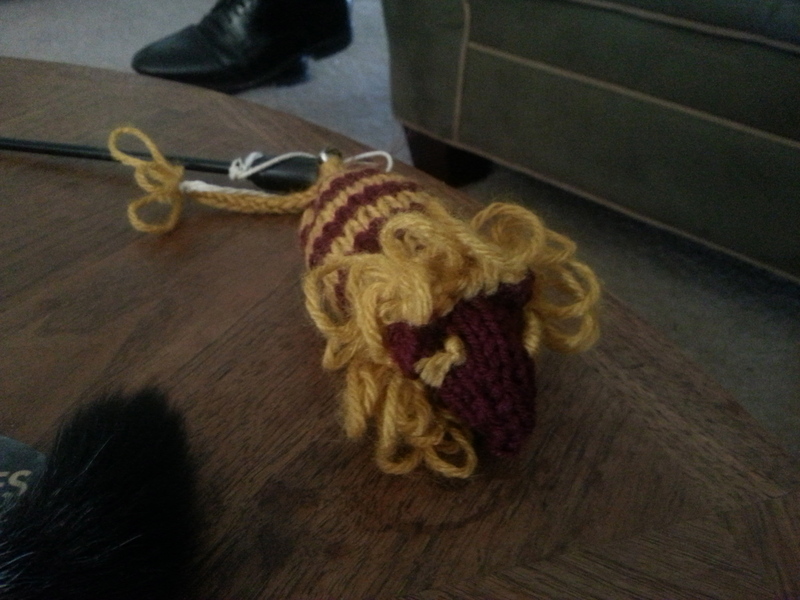 and adding some duplicate stitch in a reddish yarn to get that eerie Centurion look. These details meant that this took a bit longer than the washcloth, but because of the small size it was still a pretty quick knit. This was a gift for my grandma, and while in appearance it is the most simple, it actually took about the same amount of time as the others. 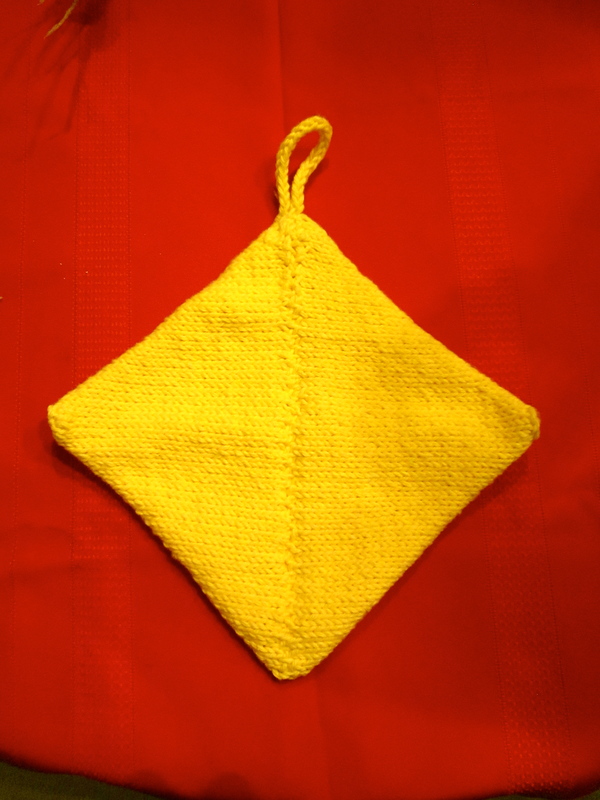 I noticed that my grandmother preferred hand knitted and crocheted potholders above all other kinds, but that they were getting worn out and too thin. I used this pattern for mitered hot pads because it was double the thickness. 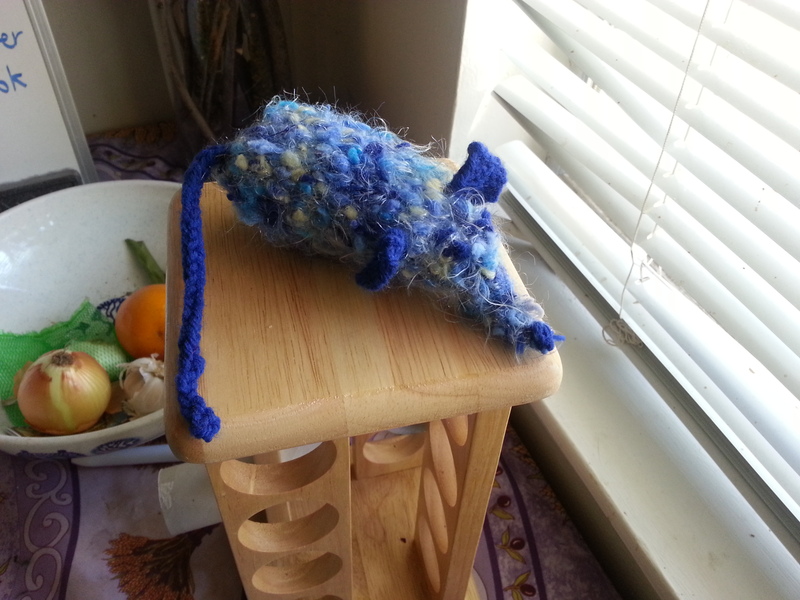 It basically requires knitting a tube on circular needles, stitching up the top in one direction and stitching up the bottom in a perpendicular direction. Worked great for me! 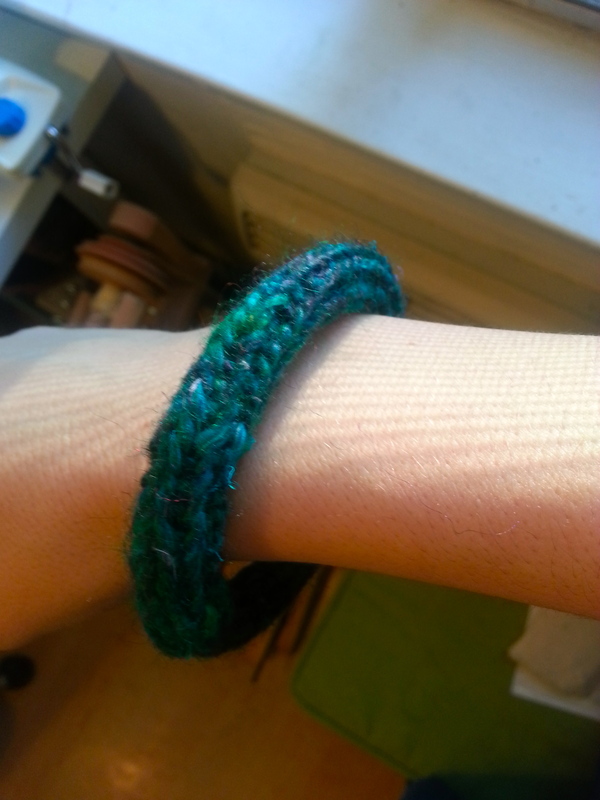 I’m sure there are many tutorials for making this kind of bracelet out there, but as since this bracelet was just for me, I decided to wing it. I love the results. 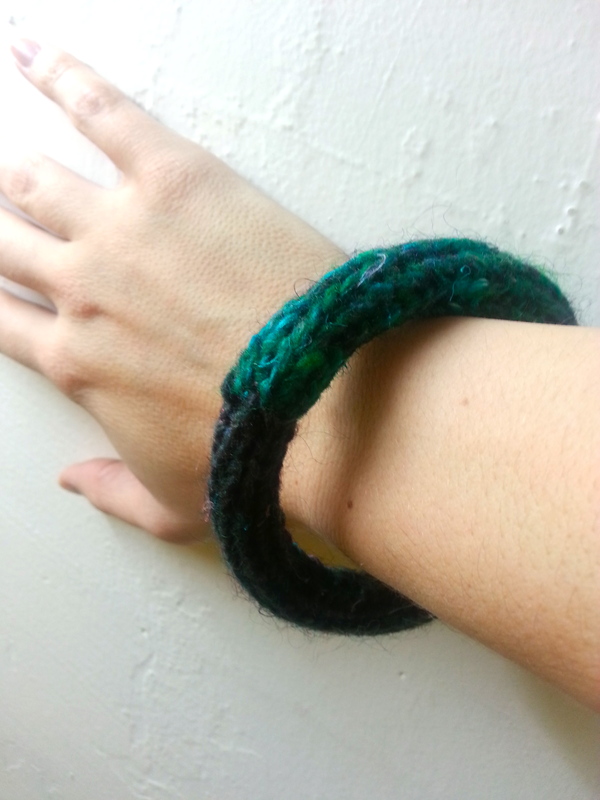 I used a plastic ring that originally held a scarf on a rack at a store, if that makes sense…I just swatched until I figured out how many stitches it would take to cover the bracelet without being too tight or too lose, knitted for the appropriate length, and stitched it onto the ring. I used kitchener stitch to connect the two ends together, but since I chose a color changing yarn, the seam is still obvious (see smaller photo). 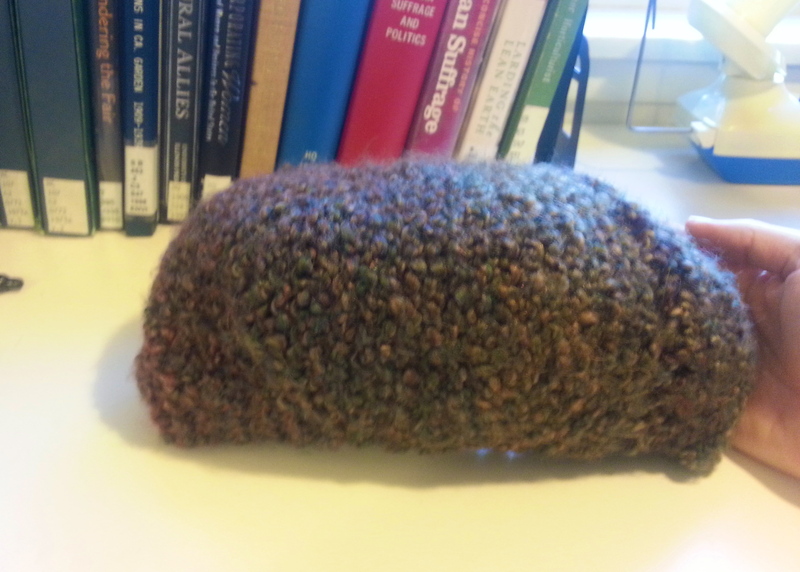 I love how this shows off a tiny leftover remnant of an amazing yarn so well. This is more of a true pattern that I came up with over Christmas. It’s a small version of the Madonna Mountain located in San Luis Obispo, complete with the big white “M” on the face. I made this for my friend Phil specifically, because he has a clothing company in that town and makes t-shirts with unique line drawings of the local scenery. I wish I had written down the details for this pattern! I came up with it while playing board games with my family, and it just kind of flowed. I believe I cast on 32 stitches in green, and then after the ribbing I started decreasing the green on one stitch per side, and adding the dark blue at the same rate, knitting from both sides of the dark blue yarn so as not to have stranding in the back. Then I did the mountain in duplicate stitch using white yarn. 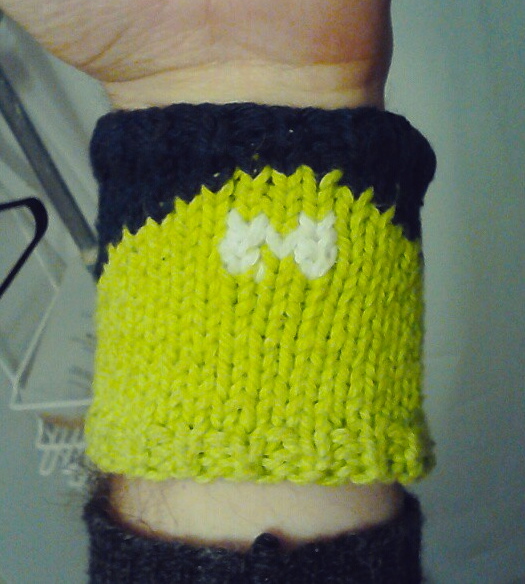 I originally intended this to be a drink cozy, but he immediately wanted it to be a wrist cuff and I was not about to argue with a guy who sells apparel for a living. I named this hat poorly because I ended up liking it way more than I thought I would. 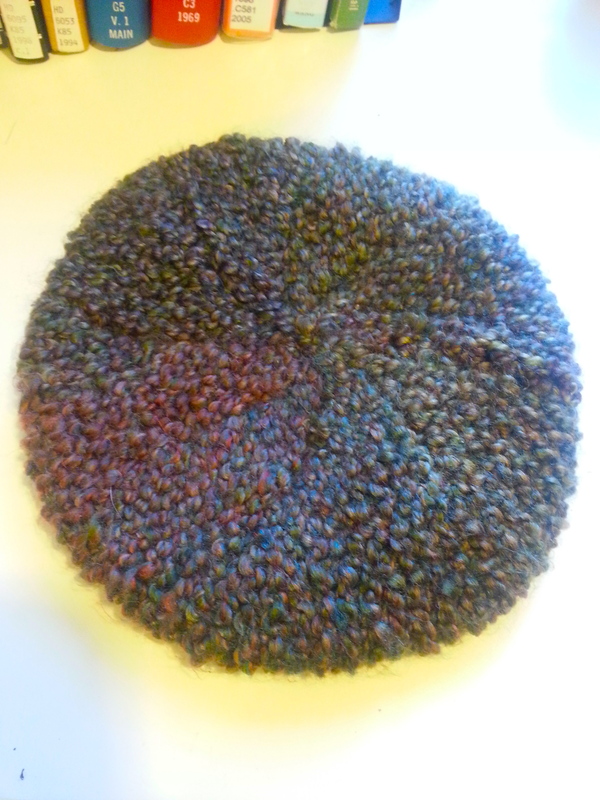 I used the urchin hat pattern from Knitty with size 9 needles. I wanted a new hat for myself that was quick and easy and could use up some crappy thickish acrylic yarn I had lying around. 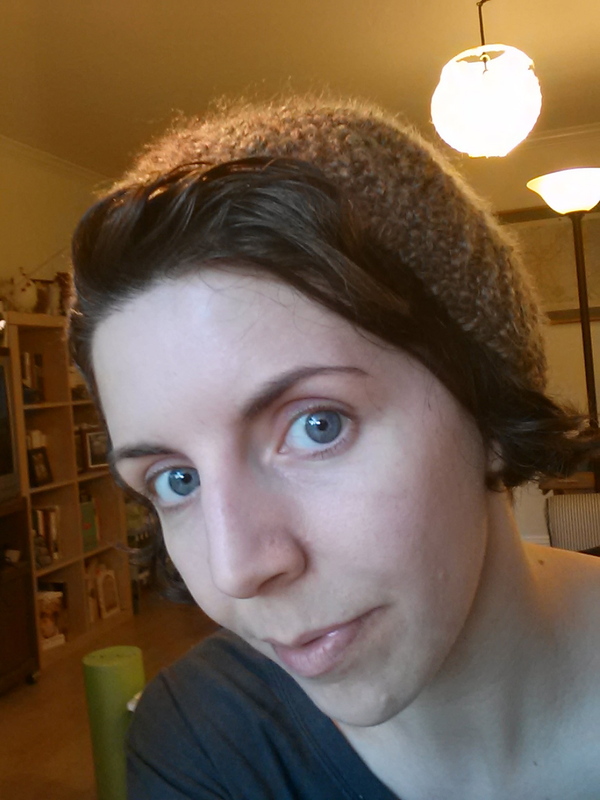 Much to my surprise, this short row hat looked lovely even in this kind of yarn. I recommend plenty of stitch markers for the short rows, because not losing track of where you are is key for these kinds of patterns. The shape of this hat is a bit hard to capture in photos, but it is beret like without being too much of a beret if that makes sense. 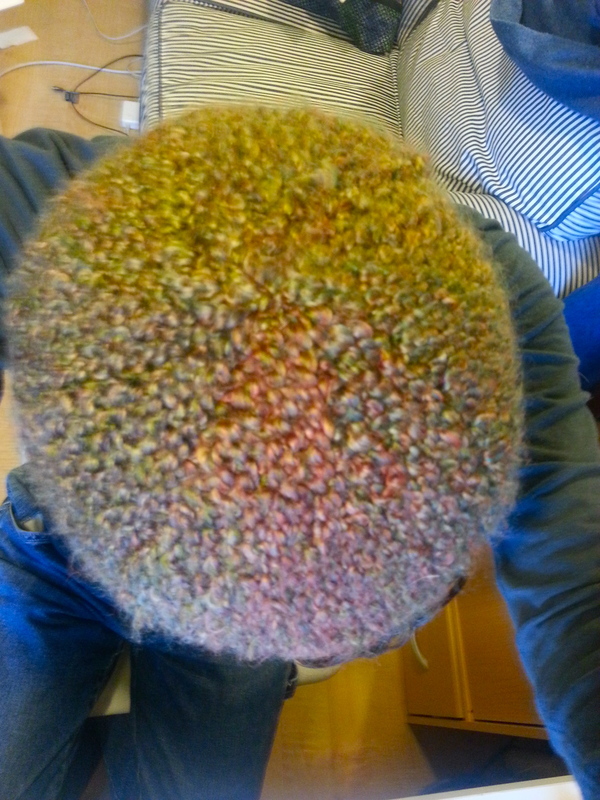 I wear it a lot when my hair isn’t quite dry, as in the picture below. The aquamarine yarn from my custom sweater is back again! 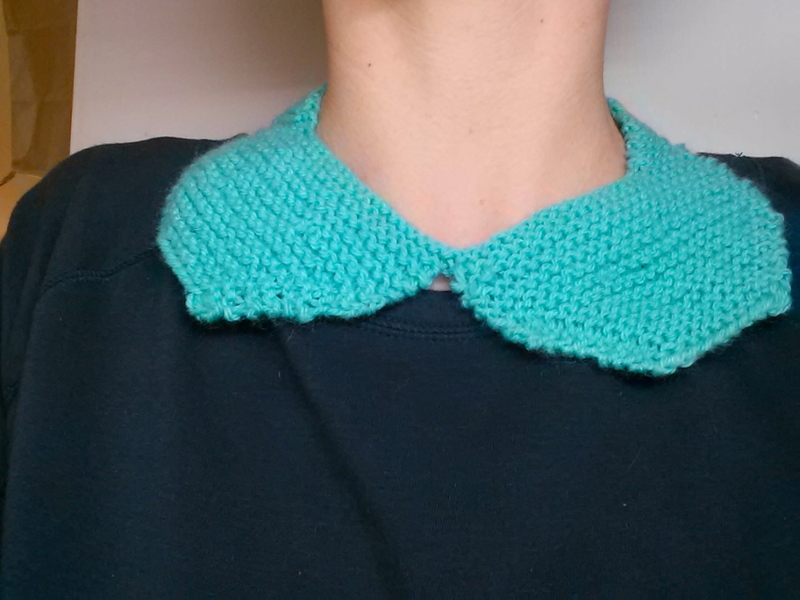 Since I had leftovers, I went looking for a way to use them up and found this lovely peter pan collar pattern. This was probably the fastest project of the whole bunch! My only real modification was more of an accident, which you can kind of see above: my button for the back is off center. I made the collar the same length of the pattern one at first, but I decided that I needed it to be a bit longer. Laziness won out and I only extended one side. It doesn’t show from the front, however. I have another collar in a different color as well, but since that is one gift I haven’t given yet, I’m not going to post it yet so it can remain a surprise for the recipient.